The title of AV Festival 2012 – a festival of art, technology, music and film inaugurated in 2003 – is ‘As Slow As Possible’, something the organisers state is a conscious antidote to the Olympics motto of ‘Faster, Higher, Stronger’. Comprising exhibitions and special events – including concerts, film screenings and talks – the festival takes place simultaneously across Newcastle, Gateshead, Sunderland and Middlesbrough, during March, combining a number of works by key historical figures alongside new commissions. Yet however much the Olympic slogan sounds like corporate management speak, and in spite of being someone who is disposed to doing everything a bit too fast, I am afraid I identify with its call to rapidity more. As such, given the rapid pace of technological change, I wonder what slowness might mean today and does it in some way equate with a nostalgia for things past? My first port of call was a series of exhibitions in institutions in Sunderland, including work by Elizabeth McAlpine, John Smith and Joe Winter, alongside a group show titled ‘Mirror Neurons’ at the National Glass Centre at the University of Sunderland. Well suited to Sunderland’s industrial history, James Benning’s One Way Boogie Woogie (2012) at the Northern Gallery for Contemporary Art consisted of a new iteration of a film that was originally created in 1977 by filming sixty locations in Milwaukee’s industrial valley for sixty seconds each. The new version presented eighteen locations that were reminiscent of the original, screened on six large-scale projections and installed in horizontal triplets opposite each other. The results functioned somewhere between a photograph and film, as most were nearly static, contained virtually no human presence, with any movement created by weather and light. In some instances industrial situations, such as derelict warehouses and factories took on formal painterly qualities, echoing Edward Hopper’s brand of urban North American twilight. Other scenes highlighted the bland qualities of these ‘non-places’, which have largely been abandoned since their heyday in the first half of the twentieth century, serving to emphasise the fact that what is engendered by one generation’s industrial advances can quickly be bypassed by the next. Installed nearby in a disused shop window was a video by Mark Formanek titled Standard Time (2012) that showed numbers that made a ‘digital clock’ shaped by from planks of wood outdoors, forming a large sculpture accurately telling the time of day. Standard Time was the result of a performance where the time was changed minute by minute over a 24-hour time period by 72 workers, who reordered the structure of the planks to read as the digital minutes 1, 611 times. Although somewhat Chaplin-esque slapstick in character, this was genuinely captivating; as each time the workers had completed one change, they barely had time to rest off camera before scampering back for the next minute – a testament to how even the most basic technological changes have radically changed the pace of life and halted the limits of purely human endeavour. Newcastle and Gateshead played host to a series of exhibitions and events in diverse venues across the city, showcasing a variety of explorations of what slow might mean today (including work by Yoshi Wada, Torsten Lauschmann, Benedict Drew, Susan Stenger and the fittingly titled offering, Jem Finer’s Long Player, 2000). But the weirdest (and possibly most interesting) was Agnes Meyer-Brandis’s The Moon Goose Analogue: Lunar Migration Bird Facility (2012), installed in the Great North Museum, Hancock. The Great North Museum is a museum of natural history containing all sorts of strange and wonderful pieces of taxidermy and artefacts from across the world; as such, this was a perfect setting for Meyer-Brandis’s video and installation, a work inspired by the story The Man in the Moone (1963) by Francis Goodwin, which tells the tale of a man who flies to the moon in a chariot made airborne by a flock of geese. Bringing this story to life, Meyer-Brandis raised eleven geese from eggs, to birth, to adulthood (naming them after famous astronauts, such as Neil, Svetlana, Buzz and Yuri). The video demonstrates the absurdity of this art-life experiment as it charts the artist talking to the eggs before hatching, bonding with her ‘babies’ when they are tiny fluffy goslings and later attempting to teach them to fly in a ‘V’ shape, interspersing scientific facts (such as how by talking to the eggs she is ‘imprinting’ the geese so they will accept her as their parent) with a narrator telling the original story. 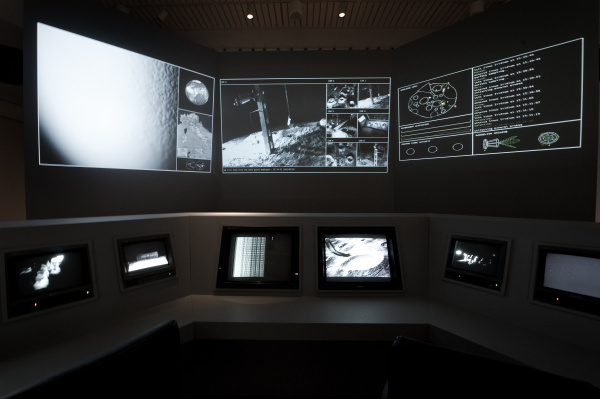 Alongside the video is an installation that mimics a NASA control room, in which live-stream of the geese in their current home (a fake lunar landscape) shows them and their daily lives on multiple video screens. All in all, aside from its function as an artwork (the artist making fiction ‘real’ was interesting, however the ‘live-feed’ aspect pushed it too far towards reality-television) it left me wondering – are the geese really happy there? And more pertinently, the work presents – however fictional – an idea of a world prior to the industrial and technological revolutions, where animals rather than machines, performed labour for humans. Alongside all of this, the festival presented a series of performances, concerts and film screenings, encompassing a ‘Slow Cinema’ series including works by Fred Keleman and Lisandro Alonso, and weekends of music at the start and finish. During the opening weekend a series of cross-disciplinary works were presented at the Gateshead theatre and in venues across the city. Phil Niblock’s performance The Movement of People Working (2012) was staged at Gateshead, in a space where the audience and the performers were seated on the same level, above which two large screens hosted projections of Niblock’s films created between 1973 and 1979 – recordings of labourers working in Peru, China and Mexico, amongst others places. Known for his minimalist ‘overtone’ compositions (where multiple sounds and instruments are pre-recorded and then layered over one another in a live performance) Niblock’s presentations need to be experienced at maximum volume to get the full physical and mental sensations this work creates – which could be described as somewhere between a meditative trance and a mild earthquake. Here the music (including Stosspeng, a guitar duet composed for Stenger and Robert Poss) and film (gritty scenes showing tough physical labour) combined to create the sense that climax was always near, but never quite reachable. To celebrate the hundredth anniversary of John Cage’s birth and twentieth anniversary of his death, the festival staged an evening of performance in homage to Cage, focusing on the theme of slowness via duration, curated in collaboration with Stenger (a classically trained flautist who, influenced by Cage and Niblock, went on to create music for flute and electronics, forming the Band of Susans in 1987). The evening included Cage’s score Postcard From Heaven (1982), performed by Rhodri Davies on the harp – a slow, lilting affair with long sustained sounds – and Ryoanji, performed by Stenger (flute), Robert Poss (percussion) and Dominic Lash (double bass) – a long work inspired by a Zen garden. Poss’s ability to keep a slow, erratic beat via a wooden box throughout was remarkable, as the pace was hypnotic. Seated in a theatre in the round it was also impossible not to notice how many people fell asleep – at any one point there were at least six people having a nap (at one point this included me and the art magazine editor sitting next to me). However this, at least, beautifully addressed one of Cage’s key propositions: that the audiences’ experience of their surroundings was just as important as the performance, something his seminal work 4' 33" (1952) espouses – where the silence of the performer pushes them to listen to the ambient sound. After several poetry readings by Kenneth Goldsmith and Alex Finlay the evening finished with Yoshi Wada’s The Lament of John Cage (1992), performed by Stenger, Poss, Tashi Wada (Yoshi Wada’s son) and the City of Newcastle Pipe Band, who, dressed in full kilts, playing a complex and physically draining piece on the bagpipe, combining long drone-esque guitar chords with rousing, joyful crescendos. If slowness can be equated to meditation and a sense of bodily self-awareness then this performance was one of the more successful elements of the festival in addressing its theme. Another work that emphasised human presence and man over machine was a performance of On Kawara’s text work One Million Years (1999), presented in the ground floor space at BALTIC, Gateshead. Comprised of twenty books – Past, a record of the date of every year from 998,031 BCE to 1969 CE and Future, which accounts for 1996 CE to 1,001,995 CE – this work has been performed as a reading on various occasions since 1993 in his solo exhibition at Dia, New York. When I entered the gallery space at BALTIC a man with curly ginger hair faltered over pronouncing the numbers, a failure that made a fairly dry conceptual work more pleasingly human. In many respects the work presented implied a yearning for pre-digital days rather than proposing what ‘slow’ might mean in the contemporary world. As such, the festival put forth a paradox: its remit in part is to focus on technology yet the technological revolutions of the last century have sped us up more that we could have possibly imagined. Here the works that dealt specifically with the passing of ‘real’ time were the ones that also addressed human inconsistency and failure: as we are unable to live up to the machines that enable us to live our multi-tasking, global, fast paced, information-hungry lives.